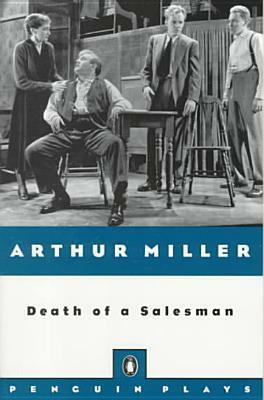 Willy Loman, the protagonist of Death of a Salesman, has spent his life following the American way, living out his belief in salesmanship as a way to reinvent himself. But somehow the riches and respect he covets have eluded him. At age sixty-three, he searches for the moment his life took a wrong turn, the moment of betrayal that undermined his marriage and destroyed his relationship with Biff, the son in whom he invested his faith. Willy lives in a fragile world of elaborate excuses and daydreams, conflating past and present in a desperate attempt to make sense of himself and of a world that once promised so much. I'm not much of a play person. I don't mind watching them but sitting down and reading a play was never my thing. Over the summer I saw Death of a Salesman at a library book sale for fairly cheap and thought I was overdue for a reread (or I guess technically a first read). See, when I was in high school I wasn't much of a reader would read SparkNotes instead of reading most of our required reading. Now I feel like I missed out on a bunch of classics! But it was nice to be able to just read the play and not worry about having to analyze it or look for symbolism. I must say I barely remembered anything about the play. Really the only thing I remembered was that the father was a traveling salesman who wasn't doing so well. But overall I did enjoy the story! I almost read the entire thing in one sitting and if my stomach wasn't growling I definitely would have! One thing I found slightly confusing was when Willy would slip back into his daydreams or memories from the past. Sometimes he would be having a conversation with a person in front of him and a different conversation with a person in his head. Reading that was confusing but I'm sure if I saw the play being performed or even having different people read for each character (just like we use to do in English class!) it would have been fine. My heart truely went out to Willy. He spent years working for the same company as a salesman but is getting older and wants to cut back on traveling. All he wants to do is provide for his family but it seems like he can never catch a break or he's just fighting with his sons. I recommend you read this play and not just skim through the SparkNotes! You really do get so much more of of it! For someone who is interested in reading more plays do you have a favorite one? Or a least favorite you'd advise to stay away from? I really enjoyed reading this play in high school, even though plays are harder to read. It's a tragic book, but a really good one! Have you seen the movie? It might be good if you could get your hands on it soon and then compare your book and movie thoughts! I believe we watched the movie after reading the play in high school. But comparing the two sounds like a great idea! I remember reading this my freshman year in college! I remember enjoying it and also having to write a paper on it. I'm with you though...I struggle with plays. I'll definitely be watching for people's responses to your question! I felt like I enjoyed the play so much more because I wasn't worried about writing a paper on it! I am not usually crazy about reading plays, but I really liked W;t. (If memory serves, there really was a semi-colon instead of an i.) It's kind of a downer because it's about a woman battling cancer, but it's good. I have heard good things about Wit! I'll look into that one! Thanks! I'm an avid fan of the theatre and I do love reading plays, but it does take some time to adjust to the style. Death of a Salesman is certainly one of the greats and I highly recommend it to everyone. Another one I enjoy is Barefoot in the Park (a rom-com of sorts) which is so funny and cute. You can even check out the movie version starring Jane Fonda and an extremely dreamy Robert Redford and it does the play just as much justice as it should. Adding Barefoot in the Park to my list! Though I have never read this particular play, I did read a few in high school and one that stuck out in my mind is Arsenic and Old Lace by Joseph Kesselring. There is a movie version starring Carey Grant, which is excellent, but I recommend reading the play first. It is hysterical! I just read the summary for Arsenic and Old Lace and it sounds like it's laugh-out-loud funny! Thanks for the recommendation! There were a few times while reading the play (especially during Willy's daydreams) that my own mind would wander and I'd have to refocus on the story. So, I definitely get where you're coming from! I'm going to go sort through my stack of scripts and find my favorites. I can definitely find some good ones to recommend. Our Town is one of my favorites, and I think a reading of it would still be good. I love Miller. DoaS is good, but my favorite is The Crucible! I know we read The Crucible back in high school but the only thing I remember is it was about the Salem witch trials. Guess it's time for a reread! I'm not a big play reader but I've been meaning to read this one. I don't know a whole lot about it but it seems to be an important story to know. As for the play itself, I was surprised by how much I enjoyed it! I've only read a handful of plays and they were all while I was in school. I'd really like to start reading them more often. Where did you go to college? I also went to college near Pittsburgh. Absolutely! Since you just read Arthur Miller, you HAVE to try All My Sons by him as well! It's SO good! I read this play about a year ago. I liked the story of the American Dream gone bad. But the play was so dark and gloomy that I found it difficult to enjoy reading it. My recommendations to you would be the plays of Oscar Wilde: they're fun as well as interesting. My favorite is Lady Windermere's Fan and the most famous one is of course The Importance of Being Ernest - which is also very amusing. I would also recommend that you check out Tennessee Williams and Bernard Shaw. where I can get that books? after reading ur review, i'm intered in reading that book. I learned it when I was in the collage. Interesting play.